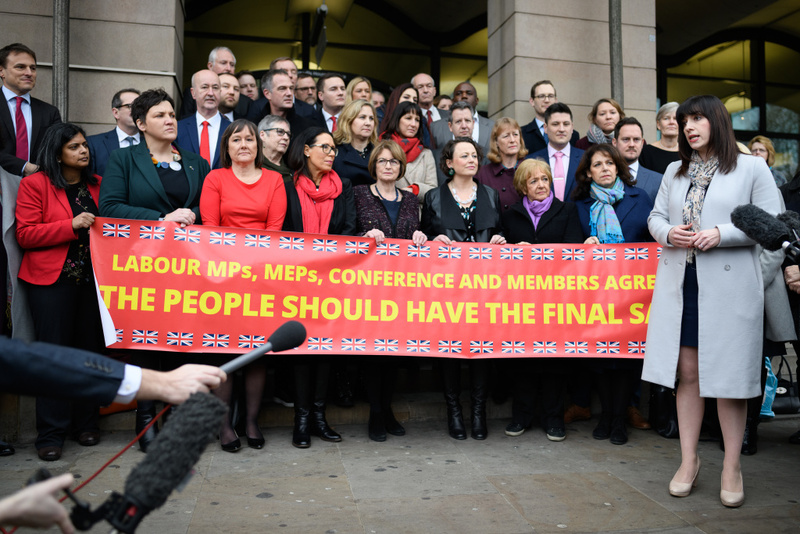 A group of Labour MPs look on as MP for Houghton and Sunderland South Bridget Phillipson (R) speaks at a photocall in a bid to push Labour Party leader Jeremy Corbyn to fight for a further referendum over the issue of Brexit. In the biggest defeat for a sitting government in history, British Prime Minister Theresa May’s Brexit deal fell well short of passing on Tuesday, suffering a 432-202 vote defeat, including 119 members of her own Conservative Party voting against the deal. To add to the bad news for the embattled prime minister, Labour Party leader Jeremy Corbyn has offered a motion of no confidence, which could trigger a general election if May loses. That will be heard on Wednesday evening in the House of Commons. May is expected to win that vote, which will give her another chance to hammer out a deal. While the deal, which May has spent nearly her entire tenure as prime minister negotiating, was ultimately torpedoed, it does not necessarily mean that the U.K. won’t be leaving the European Union on the March 29th deadline it originally set. However, it does raise a lot of questions about exactly how Britain will exit the EU. Prime Minister May could still negotiate a deal, but some lawmakers would prefer to see Britain leave the E.U. with no deal at all, which some worry would lead to economic downturn. And yet other MPs want a second referendum that they hope would overturn the first one, meaning Britain would remain in the E.U. What happens now for the U.K. as a country? And what about Theresa May’s future as prime minister? What are the chances that she loses the no-confidence vote, and what would happen if she did? Britain’s Parliament votes, again, on Brexit blueprint. Would the outcome be any different this time?